Despite us trending toward smaller, more fuel-efficient vehicles, car makers would be remiss to forget about those buyers who need the functionality of a large SUV. 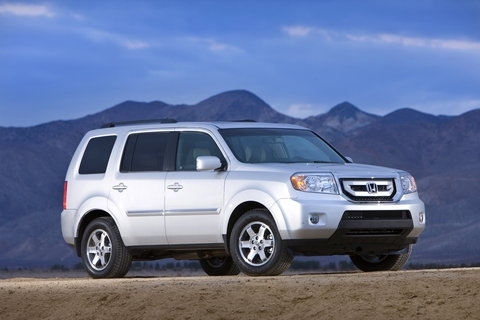 Redesigned for the 2009 model year, the 2010 Honda Pilot – Honda’s largest offering – is exactly the vehicle for those looking for three rows of seats, optional all-wheel drive and a slew of technology accessories that target both adults and kids. 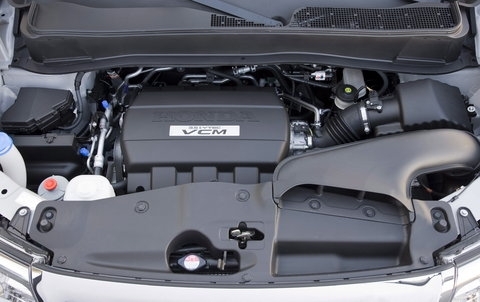 An efficient V-6 engine nets the Pilot a standard 23 mpg highway in front-wheel drive guise, too. The boxy exterior design, large cabin space, storage areas in every row and easy-to-fold rear seats make the Pilot a utilitarian in almost every way. However, since the Pilot is actually a crossover SUV – meaning it is built on a car’s unibody platform – it boasts a comfortable ride as well. The large SUV segment is a tough one though, and there are nicer interiors out there and competitors that undercut the Pilot’s price, so you’d do well to shop around. Even in AWD trim, the Pilot still manages 22 mpg highway, making road trips a fairly guilt-free endeavor. It’s a Honda, which means its ride is superbly comfortable, and the many cubbies and storage spaces allow drivers and passengers to keep personal effects tucked away easily. In a segment that’s seeing a trend toward rounded body styles, it’s nice to see one that remains boxy and tough looking. We like the economy of the V-6 engine, but it does tend to be underpowered and works overly hard on hills. Visibility, though generally good out the front and rear, is compromised by large B- and C-pillars. Utilitarian styling can be off-putting to some, especially for those who like a bit more luxury in the interior, and the price, while starting in the upper $20,000s, can quickly reach $40K. 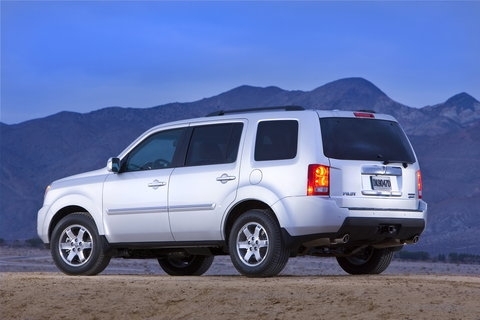 For such a practical looking SUV, the Pilot’s ride is more car-like than anything else. It may ride high, but it doesn’t feel top heavy in corners or lumbering on the road. Steering does feel vague though, and at times you’d be hard-pressed to know where the wheels were pointing. Wind noise is kept to a minimum, with only engine noise permeating into the cabin when the car downshifts for hills. The ride height generates a good amount of visibility out front, and the large rear window isn’t any trouble to see out of either, but blind spots are plentiful with the thick side pillars. Generally though, the cabin is a pleasant place to be; the middle row of seats seem to have as much leg and headroom as the front, which is something your passengers will certainly appreciate. The Pilot comes with a 3.5-liter aluminum V-6 engine, producing 250 horsepower and 253 lb-ft of torque, the same numbers from last year. The engine is coupled to a five-speed automatic transmission that provides smooth shifts, coupled to either front- or all-wheel drive. A variety of trim levels provide an array of standard features for the Pilot, including split-folding rear seats, cruise control, a tilting/telescoping steering wheel and an auxiliary input jack for your mp3 player. The middle-of-the-road EX trim offers tri-zone climate control, heated side-view mirrors, XM radio capability and fog lights. All Pilots can carry a total of 87 cubic feet of payload when the rear seats are properly folded, boast 12 cup holders and have impressive safety features. The Pilot comes with dual front, front-side and three-row side curtain airbags on every model, as well as a standard tow hitch. 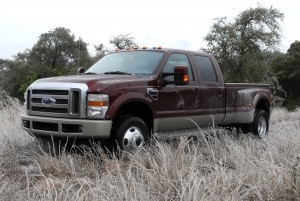 A power lift rear gate is available when equipped with the top-of-the-line Touring package. The Pilot is available with a navigation system that has a number of road trip-friendly features like Zagat restaurant ratings and voice-activated controls. It’s easy to use despite the slightly outdated interface and graphics. A DVD entertainment system for the rear passengers and an impressive 10-speaker sound system are also available, though those bells and whistles boost the overall price tag considerably. Honda’s large SUV dishes out respectable fuel economy, with the front-wheel drive model delivering 17 mpg city and 23 mpg highway. The all-wheel drive version returns numbers that are just slightly lower at 16 mpg city and 22 mpg highway. The Pilot has a ULEV-II emissions rating. The Pilot’s interior features controls located just within reach. In Touring trim, a snappy leather-wrapped steering wheel houses audio and cruise controls. Brushed aluminum accents, clean gauges and a comfortable seat welcome the driver. The back seat offers nearly as much room as the front. An optional power lift gate makes loading a cinch, and fold-flat rear seats allow for a truly customizable cargo area. 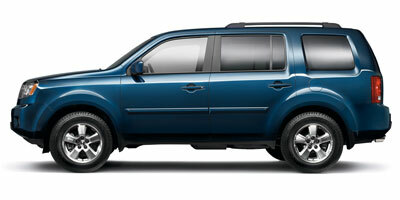 Honda completely reworked the Pilot’s exterior for ’09 and the reaction has been varied. The truck’s nose received the most surgery, borrowing design cues from the Ridgeline and Element. The angular, upright grille and squarish hood deliver a more aggressive look than previous Pilots, something that Honda loyalists may find offensive and newcomers to the brand just might see as refreshing. For the most part, the Pilot’s pricing places it in the middle of the pack, with a $27,895 starting price for the 2WD LX trim. Chose the top-of-the-line 4WD Touring and the price jumps to $38,645 – not including options. That’s a bit steep for a group that includes the $29,224 Chevrolet Traverse, $27,500 Toyota 4Runner, and more importantly, the new Kia Sorento, which starts at a game-changing $19,995. As far as functionality goes, the Pilot nails it in both styling and interior space. Pricing can head north a little too quickly though, and some of the technology in the car has already been overshadowed by its competition. Ultimately, typically useful features from Honda and a comfortable ride make this SUV a great vehicle for daily use and a good choice for a large, busy family.